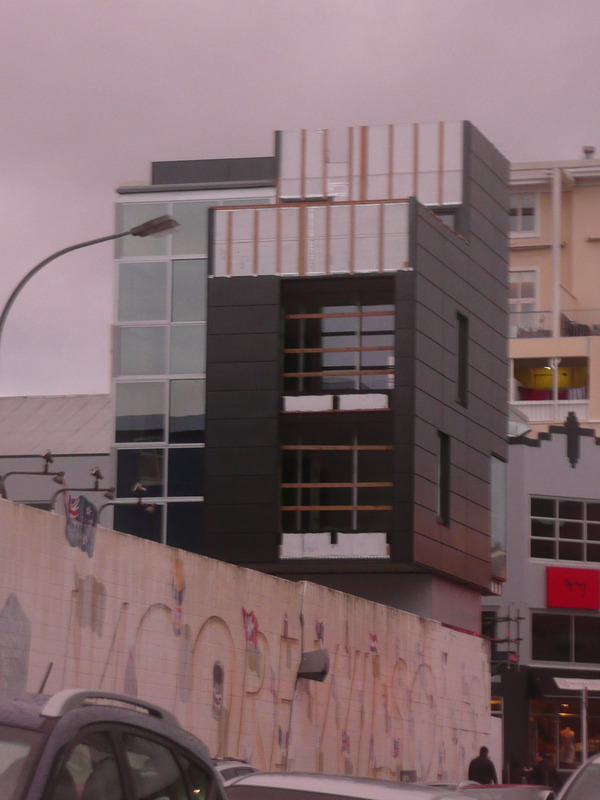 At last: a return to what this blog was set up to do – a review of a local building. This one is really aimed at keeping DavidP happy, who has undoubtedly noted this progressing along. It is not quite finished yet, but is forming a much needed edge to the formerly neglected corner of Tory and College St in downtown Te Aro. We’re talking of course about this building, a rebuilding of the iconic (oh come on, really, it WAS) corner turret of Moore Wilson’s. I haven’t seen a sign on it, but it surely must be an Athfield job, as they have been the architects on every square inch of the Moore Wilson emporium since, well, way back in the day when MW opened. Well, ok, not the 1890s or so when Mr Moore and Mr Wilson got together (need to check my facts), but I’m thinking – since the 80s when Athfield dreamt up the whole ‘after the quake’ scenario for the design. 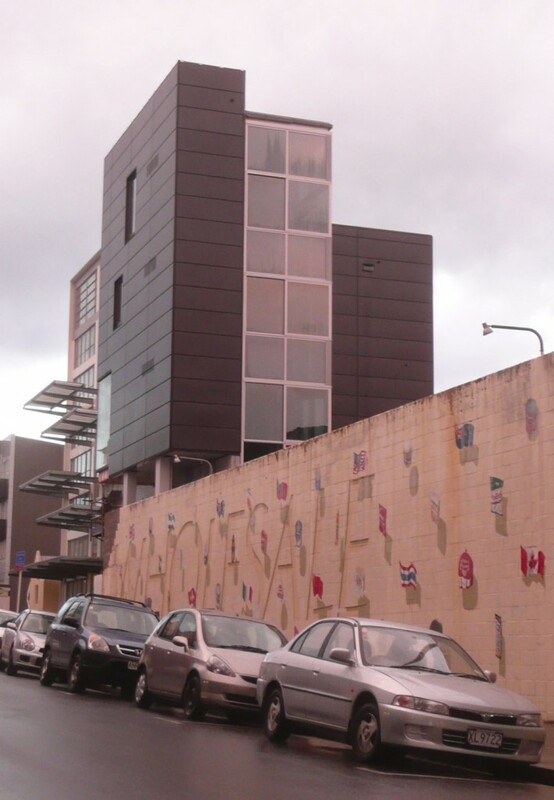 The giant wedge splitting the wall, and the post-modern turrets to the west facade date from this time, along with the former corner (now demolished) which had the visual joke of subsiding down into the floor below, at a jaunty and crooked angle. That joke had got a little stale over the years, and the tilted box was chained off and getting vandalized over the last few years, so it is good to see a new solution in this corner. Is someone going to live there? If so, their front door step and view will be – a car park ? The volume appears as though it could be small apartment size ish, and there is no doubt that it will enjoy good all day sun, and unobstructed views, with the world’s greatest food store on the doorstep for good food foraging. But while I do love the urban life, even I might object to living in a car park. I had expected something to happen on this corner for sme time, especially since the completion of the east side of Moore Wilson’s, but I guess I thout this edge might have had more happen to it than just a solitary tower. A cluster of apartments perhaps? A redesign from the ground up, doing away with the worlds worst and unnecessarily complicated car park entry, but not touching the best small urban courtyard in Wellington? 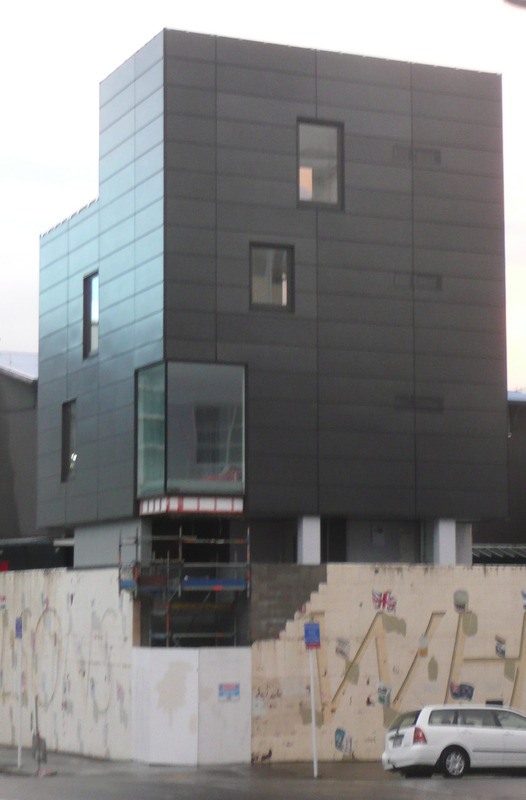 One solitary zinc-clad tower was not quite what I expected, no matter how much I appreciate it’s pretty proportions. And if they continue with the rest of the scheme for these edges, you really will see something to make you smile, as well as a verandah over the footpath on both streets. You should request the plans from WCC and post them! As for other reviews, how about one of CoCA? Or has that been covered? >This one is really aimed at keeping DavidP happy, who has undoubtedly noted this progressing along. I had noticed it, although anyone using that stretch of Tory St these days will likely be distracted crossing and re-crossing the street to avoid the cones, barriers, and traffic wardens at Il Casino. Much as I like the faded Kiwiana, that is still a flat mostly-blank wall. It’d be nice to do something with it, even if it is just adding a verandah. I think Tory St has a lot of potential. If it passes over an underground bypass then it’ll lose some of its bypass-bound traffic and become more of a street for hanging out. The conversion with the wavy white decoration is filling up with a Singapore themed restaurant, and a fish and chippy is due to open soon. On the other hand, the excellent Red Ginger has closed. The inside of Red Ginger was dead cool, and the food wasn’t bad either. Going one further with the minimising of cross-city traffic, what would be the likelihood of Tory (at least down to Courtenay Place) being turned into a *gasp* shared space? What’s the difference between a hipster and a faux hipster? I think the real hipsters are the ones with their cardigan buttons done up. Hip or not, I’m optimistic about Tory too, but a little uncertain about that north-south wind tunnel effect. The cross streets seem to offer more sunshine and less turbulence. One is trying, the other trying to look like they’re not trying to look like one. Er, Red Ginger was terrible, and I’m not sorry to see them go. SMM>Going one further with the minimising of cross-city traffic, what would be the likelihood of Tory (at least down to Courtenay Place) being turned into a *gasp* shared space? Blair and Allen Streets work for me. Part of the attraction is that they’re calmer than C Place. I think Lower Cuba is shaping up to be quite good, although the mix of pavers and tarseal confuses me and a couple of buildings really need some work doing on them. Rather than having a few shared streets, why not make sharing the default for the CBD? There are a few “trunk” routes where I think traffic should have priority and pedestrians should stick to the footpath (Jervois, Victoria, Wakefield, Taranaki etc). But I don’t have any issue sharing the rest, forcing the traffic to drive at jogging speed, and allowing pedestrians to mix with the street in the same way Italians do on their streets. Even Lambton Quay should be more shared and less a high speed through route for buses and cars. Instead, the council seems to be promoting a bus canyon through the CBD. They’re taking away pedestrian crossings and replacing them with lights. Then you have the nasty barriers up by the Majestic tower. These things are all making Wellington less walkable and, in my opinion, a less livable city. It won’t hurt bus passengers to slow down, to stop at pedestrian crossings, and to arrive at their destinations a few minutes later. It might encourage a few of them to get off their bus and mingle with the rest of us. SD – one of the little Fish went to the Council today to do just that (ie “request the plans from WCC and post them!”), but the Council have no record of anything other than the current scheme. Which seems to be mainly a staircase, with 3 storey living attached. So… unless you want to email them in… we’ll just have to wait. I did some urban design assessment on this proposal when I worked at WCC a while back. Several things were proposed as part of initial discussions, but as the proceedings of pre-application meetings remain confidential I can unfortunately divulge no more than what you see in the publicly available documents. Suffice to say, there were some ideas that would have brought quirky visual interest to this corner. I had thought that a glass verandah around both facades was on the plans for the proposal though? That would be a good addition to both of the footpaths. And I hope they continue with some form of updated expresson of the business on the exterior – this is one of those locations in the city that we’ve come to expect seeing something a bit different. Of course, someone from Athfield could always write in with a picture to let us know… but they seem very quiet up there on the hill. Perhaps they haven’t even noticed that their work is being discussed? Any feedback from Khandallah Kastle?